January 2017 - Previous Photograph Competitions - Military Airshows. 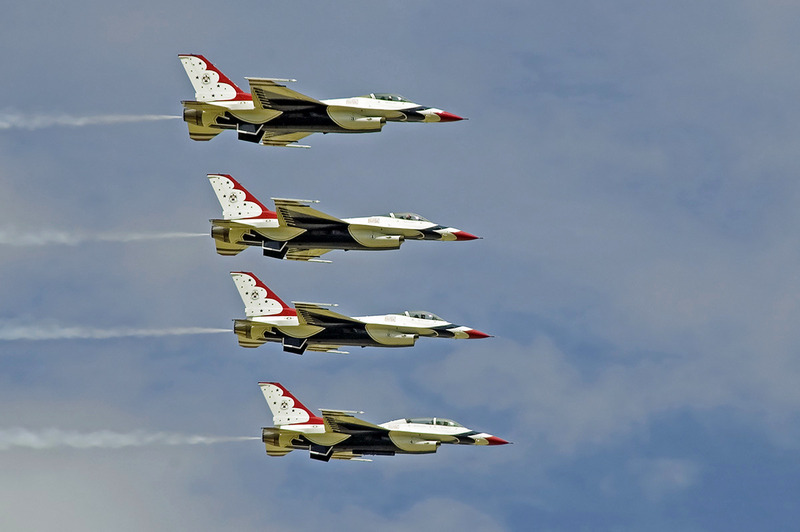 USAF Thunderbirds during their last visit to RIAT in 2007. Taken on a Nikon D50 with Sigma 28-200mm lens. Freece Tricolori at Mildenhall in the early 1990s. John Bilcliffe Royal Navy Black Cats at Waddington 2011. Canon 50D and 100-400 lens. KAN USAF Thunderbirds at Huntington Beach, Southern California Airshow 2016. Canon EOS700D, with 700-300 IS USM lens. Socata TB-30 Epsolon's of the Armee de l'air at Duxford. Nikon D300, 70-200mm F2.8. Terry Crocker Frecce Tricolori at Luqa in September 2014. They are in very close formation with everything down. Mandrake7 Yakovlevs Display Team at the Torbay Airshow 2016. Sony Alpha 350, Sigma 70-300mm telephoto lens. The Reds' syncro pair at Duxford in September 2016. Canon 7D Mk 2 and a Canon 100-400 MK 2 IS Lens.